Even in the hardest times. When lessons were learned or whenever I was just a confused boy. There’s this sacred thing. Mother and child. Painted in pictures a thousand years old. When you see it, you feel something. Sometimes that feeling hurts, sometimes it reminds you of where you came from. Sometimes, there is peace. There is a lot to be said of how we live our lives. I chose to be safe, most of the time. And then, I chose to venture outside of that sacred space. I witnessed heartbreak. I experienced a lot. More than I was ready for. But then again, we are never ready for the things that change us. There are millions of things to say about moms. There are people who can say them better than me, that’s for sure. Since I can’t be near her on this very important birthday, I will choose to write this. Because I can’t cook for her or be present with her. Which, to a mom, there is nothing like having all of your babies happy under one roof. At least I can assume. My mom is my connection to this world. In everything I have experienced, and have yet to see, will be processed through what she gave me. For me…she is strong because there are times when she needs to be. When I need her to be. And also, to mourn with me. She is the maker of sweets. Chess squares. Pecan pie. Banana puddin’. Butterfinger cake. 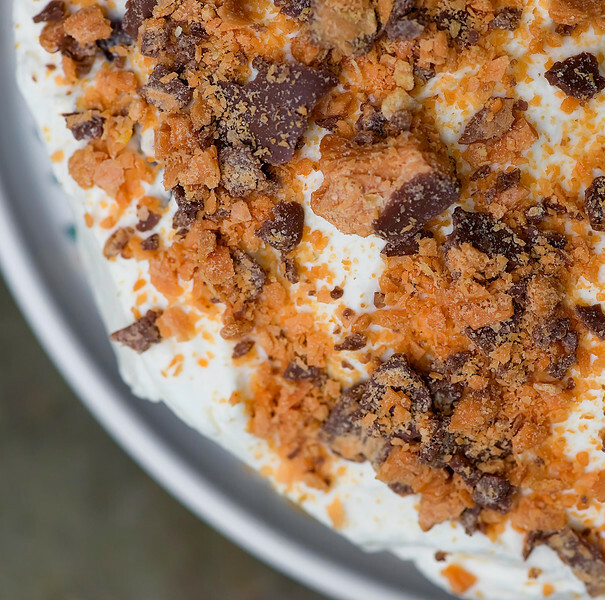 Oh, butterfinger cake. Needing something salty after something sweet. My mom is my connection to this world. In everything I am given, I thank her. When she shifts because I shift. Like those belly pains long ago. I complain about my broad shoulders because it makes me look awkward in shirts, and I apologize for you having to birth them. You gave them to me. To hold back and be strong when I feel like shutting a door on everything. Even when I am flustered and confused and working it out. I imagine your fingers washing my hair in the sink as a kid. I imagine my lack of hair now, and when I first shaved it off and took a look in the mirror and freaked out. I knew I was safe, there. You know what’s important. It’s obvious I’m still trying to figure it out. But I’m well on my way. Because my mom is my connection to this world. A week from today I will have a very important birthday (by society’s standards, by mine, one I’d prefer not to think about). My son is 5585 miles away and your . . . . excuse me, I need to wipe the tears. . . . your very beautiful post truly makes me weep. Your mom “done good.” Happy birthday to her. The greatest gift a mother could ask for is words like this from her son. Beautiful! Happy birthday to your mama. She must be some woman to have a son like you! This is great Josh! Your mother is truly a wonderful lady. I know she is proud of you! A lovely tribute to an, obviously, special person.